Christmas can sometimes feel broken. Instead of being a season filled with warm feelings and special memories, it can become a time filled with heartache, from things like the death of loved one, financial woes, family turmoil, loneliness or divorce. Since my childhood was wonderful, Christmas was the same; it never felt broken. We were not wealthy, so Christmas was simple, but it was nonetheless always special. The only thing broken about it was the occasional ornament that fell the tree. It was not until I married into a ready-made family, and experienced the holiday problems that come from being part of a blended one, that Christmas first felt broken. It wasn’t due to lack of love for my husband and new family; rather, it was from the complications of trying to mesh all the different family traditions, and bridge the miles of separation from extended family members. Right after our first Christmas together, I traveled alone to visit my family, since my husband could not go with me. Lost in the hurt over the complications, I remember wondering whether there was any way that the season would ever be the same again. Christmas as I knew it felt hopelessly broken. As God would have it, He directed my attention to an in-flight magazine article about blended families at the holidays. I never forgot one suggestion, about how to overcome the challenges that these families often face at Christmas. If your former Christmas traditions can no longer work, begin new ones. 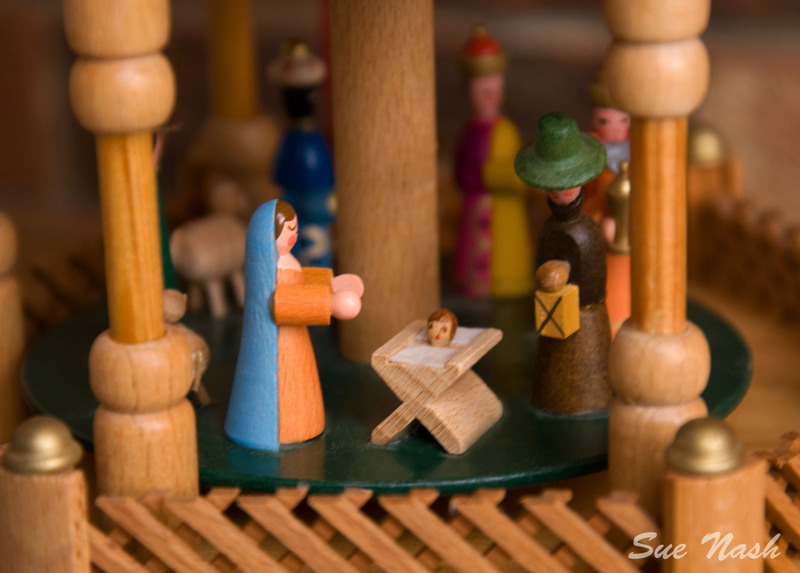 The idea was simple, but God used it in a remarkable way to help mend Christmas for me. I could no longer hold on to what I had always expected, but instead needed to start something new. After discussing the concept with my husband, it didn’t take long for us to decide on a new tradition. 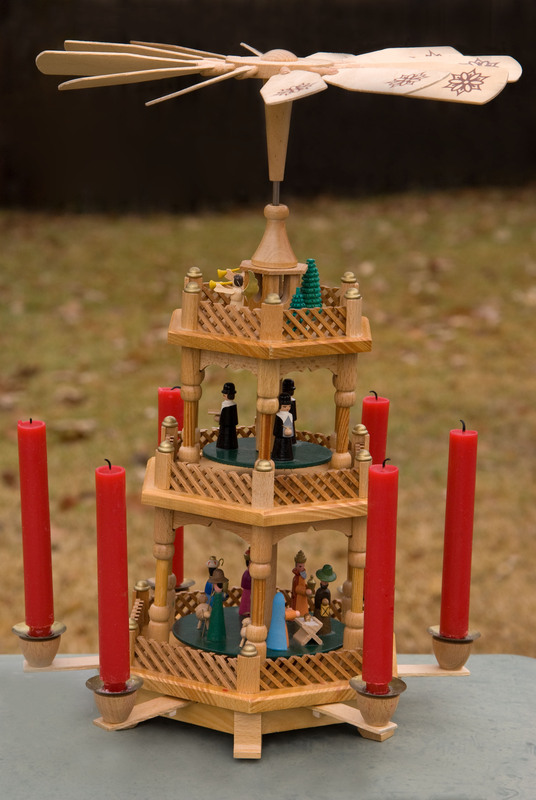 On that first Christmas together, my husband’s brother gave us a wonderful gift: a handmade German nativity pyramid. The original candle were small, but have long since been used, so now we make do with whatever candles we can find. The next year, we started a tradition of our own, of gathering together for a special time of lighting our German nativity. After the candles are lit, we listen to someone read the story of Christ’s birth from Luke, then dim the lights. With favorite carols playing in the background, we watch as the heat from the candles causes the windmill above to spin the entire pyramid in a glorious display of light and blessedness. As the years have gone by, we have come to treasure our candle lighting tradition. We have many fond memories of other family and friends that have joined us in remembering Christ’s birth in this unique way. It may seem too simple an idea to have helped mend something broken about Christmas, but it did. Absolutely not. We live in a sin-stained world, filled with imperfections, so Christmas is never perfect. Only Christ is. But He knows how to heal the hurts that steal our joy in celebrating His birth. 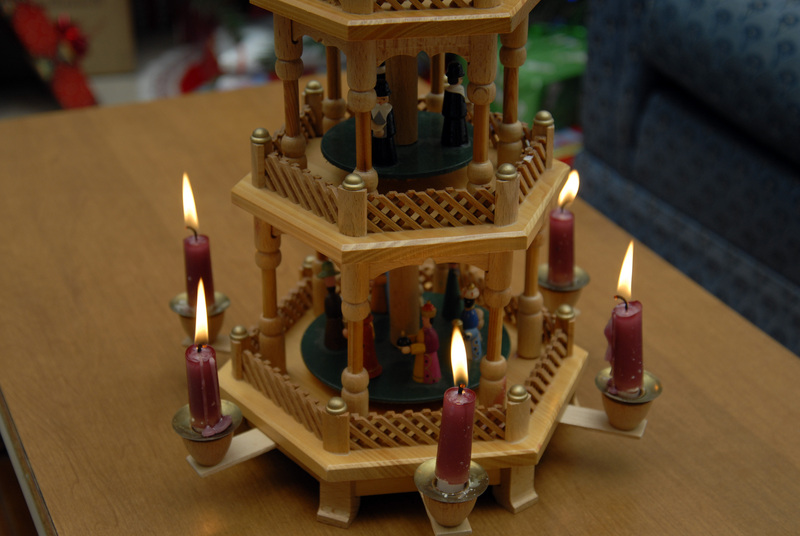 He can use anything, even something as simple as a German nativity candle to help fix what is broken about Christmas. Do you feel like Christmas is broken? Reach out to Jesus this year. With His help something new can begin. Something that can start the process of mending the hurt of a broken Christmas. This entry was posted in Random Thoughts and tagged brokenness, Christmas, German, Holidays, Jesus, Luke, Mary, photography, traditions on December 18, 2013 by heavenlyraindrops. This whole post is absolutely beautiful.